Mark and Wendell Presgrave with some of the collected food that will be distributed to needy people in the D.C. metropolitan area. As founder of a successful Virginia plumbing and heating company, Wendell Presgrave counts himself among the fortunate — but it wasn’t always that way. While growing up the northern Virginia town of Chantilly, his family was “a little poor” — so much so that his mother would re-dye his jeans and hand them down to his brother every time the school year started. “My brother didn’t realize he never got new jeans,” Presgrave says. Now that Presgrave is living a more comfortable life — and able to afford new pants — he feels compelled to give back to the less fortunate. 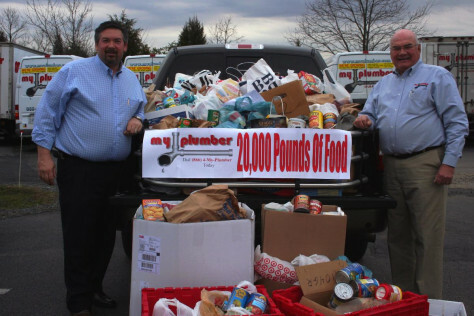 Every holiday season, My Plumber Heating and Air, the 130-employee Manassas, Va.-based company he runs with his son Mark, collects food from customers (in return for service discounts) and distributes it to needy people in the area. The company has distributed more than 70,000 pounds of nonperishable food in the past six years, and has set up a Web site to encourage other service businesses to follow suit. The charitable deeds of Presgrave and his employees were among more than 200 stories sent in by msnbc.com readers — some fortunate, others less so — describing how they are giving back during a holiday season fraught with economic uncertainty. To view a gallery of images and read more stories, click here. My dad and I have a Black Friday tradition, where like many others we get up and go shopping at the crack of dawn. We've been doing this for many years. Our purpose is to buy toys and gifts to give away to those in need. We have so much fun picking out toys and other goodies for children of all ages. We give to various toy drives, like Toys for Tots, Community Center Toy Drives, Salvation Army Angels, and others through our churches and work. We filled the car this year (twice!) with toys to give away. I now live in Alabama, and my parents live in Oklahoma. We split the toys, and I bring half back to Alabama to give away here. We have so much picking out toys that we think kids will like and will provide them with some joy. We look at all of the ads on Thanksgiving and make our lists of the things to buy. It is always fun to give to Toys for Tots on that day when sometimes the Marines are there in person collecting the donations. It is this day that truly gets us in the Christmas spirit, even with the mad crush of people! — Susan Jurney, Tuscaloosa, Ala. I live in Michigan, where the winter days can be pretty sunless at times. It seems to me that the lack of sun in the winter months can sometimes add to some people's loneliness and depression. So when I was in Rite-Aid the other day and saw a box that said "Solar Sun Jar," I thought, how fun! I can capture sunlight in a jar! Then give it out to someone that needs to know they are being thought of by giving them a jar of cheery sunlight! I bought the store out. So far I have given one away and it brought a big smile from a man that forgets to smile at times this time of the year! I noticed he has it sitting on his desk at work, and I've caught him covering the lid with his hand at times ... and smiling! Smiles can light up a room and a life! Smiles are a good return on my money, don't you think? — Laura dela Grange, Honor, Mich.
First, let me say that I live off $812 a month and struggle every month with bills, gas, car insurance and so forth. But I love to give. I have found a family with a 17-year-old who has a 3-year-old daughter. Their struggle is worse than mine. With my limited budget, God has allowed me to purchase a coat, tights, thermal underwear and an outfit for the 3-year-old and most of the items came from a high-end store. I have also donated to my family's fund to raise money to adopt a family for Christmas. I love to find bargains, I love to give and I love to see the promise of Christmas fulfilled on the faces of little children and senior citizens on Christmas Day. Also, I have a niece whom I really love and I have managed to buy her an outfit, hair bands, several turtleneck tops and a T-shirt. Tonight, I was caught in a snowfall because I was out looking for a toy for the little girl I mentor through a local school program. I managed to get her a game (small one) and a T-shirt. And if you think I have money, I don't. I had to pray all the way home for a safe trip in the snow because I need tires on my car. But, that's OK, at least I know that I am able to give not out of my plenty but out of my little. And that makes me happy. — Pamela B., Frederick, Md. I'm treating my customers to a bag of Starbucks coffee which I place in their breakrooms. The few commercial customers that I service faced tough budget cuts resulting in no raises for their employees who are already having a difficult time. Even though my janitorial business is barely making a living for me, I felt that the customers that I do serve deserve something special when they go into work. — Donna Gonzalez, Tulare, Calif. While at the grocery store last night I had a "moment" while walking around deciding which fruit I should pick. Apples, oranges? I thought to myself, oh he! !, just get them both. Further I walked the store. Should I get chicken or salmon? I’ll get both. I went to get toilet paper — big 12-roll or single four-roll? Oh, I decided, I hate running to the store for toilet paper. I’ll get the double 24-roll and be done with it. I went to the ice cream aisle, passed it by thinking of my diet. I did however stop and buy a few bottles of wine to have in the house "just in case." I filled my prescriptions, bought my cats tuna and headed to the line to pay for my "wants." I stood in line reading the US weekly and Tiger’s demise in the public eye and gradually I noticed the lady in front of me. She had two young kids barely toddlers, counting her change and pennies, giving the cashier vouchers for most of the items she had purchased, apple juice, bread, milk — necessities, things you NEED. As the cashier finished ringing up her order she indicated which items she could use the vouchers for and which she could not. Seems the could-nots totaled more than the young mother had — $7.52 more. As she looked embarrassed and at the items she thought she would have to do without, I passed a twenty to the cashier and quietly said, "Here, please pay for the remainder of her groceries.” The young mother looked at me, eyes wide, still embarrassed, and said, "I couldn’t possibly," and I said, “I couldn’t possibly either … let you walk out of here without my help." I am a faculty member at a large public university and work one day a week as a nurse practitioner at the local homeless shelter clinic. This year, the shelter is overwhelmed and overcrowded. More and more people, many middle-aged and elderly, are ending up here because of the lack of jobs and affordable housing in our area (metro Detroit). These are people who never thought, in their wildest dreams, that they would be where they are now. 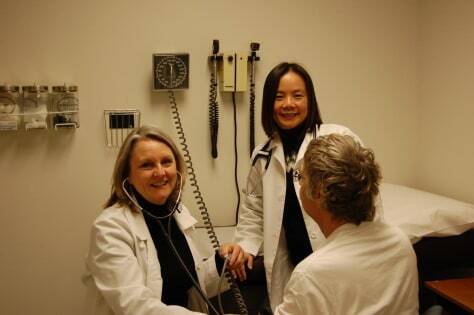 Dr. Deborah Sampson, left, and Dr. Annie Kao at the Robert J. Delonis Center Health Clinic in Ann Arbor. Every day, I leave my job grateful, almost to tears, for my home, spouse, career and job. I go home to my own bed, plenty of food, and paid bills. Did I say that because of the recession, the shelter's funding is projected to drop dramatically? Well, this year, because our family has everything they need, we are donating all our holiday "gift" money and a week's salary to the shelter general fund. That is the beginning of our giving yearlong to those who struggle to survive and stay hopeful in light of a life reversal that I am not sure I could survive. — Dr. Deborah Sampson, Ann Arbor, Mich. This winter we knew would be rougher for everyone. I am a single parent with a 10-year-old son. We decided that this year we would take half of the money I would spend on him for Christmas and spend it on a needy child. We then picked a 6-year-old girl from his school that lost her father this year. We knew it would make her first Christmas without her father a little better for her. She will not know who gave her the gifts, only that Santa came to her house after all. My son and myself will be warmed by the thought of making one deserving child Christmas a little brighter. — Lynn Lewis, Muncie, Ind. A lady at my workplace organizes a canned food drive every year, and I usually contribute a bag of food. This year, I kept forgetting and decided to give her cash. She said she would be happy to do the shopping. While I was thinking about it, the thought of asking other co-workers to chip in developed. I approached one of my co-workers and asked her what she thought about the idea. She agreed it would probably be acceptable to others, so I decided to try it later on in the week. About two hours later, she stopped by my cube with a buck or two, so I decided to start right then. Before too long, I had nearly $250, and requests from many to come back later. Mine is simple, short and I do it every year. I purchase between 100 and 500 Santa and Elf caps (depending upon my finances), and cap everyone for the holidays. It's funny how many people ask if they have to give it back. Restaurants and bars are the best ... everyone gets merry instantly. A few people have been capped more than one year and I frequently get asked, "Aren't you the Santa hat lady?" during the rest of the year. — Robbin Jones, Bothell, Wash.
Laredo, like many communities in our great country, has felt the impact of these economic times. Our local faith-based organizations decided to do something about it. With the help of our congressman, Henry Cuellar, we were connected to the FEMA trailer donation program and, in late August, The Bubble Home Project was born. Our mission was to help change the lives of some local needy families by providing them decent and adequate housing. The goal was to raise enough money to place 12 families by Christmas. When our phone lines first opened we were flooded with over 5,000 calls. Our local community centers pitched in and during our first four orientation sessions we had over 300 families pick up the "first step" applications. Two weeks later, right after Thanksgiving, just over 50 families came back with the necessary documents and picked up their full application packet. During all this activity The Bubble Home Project team was running at full speed raising donated funds for this project.